4. Eris is inconjunct Pluto (there is an overdose of intensity when there IS disagreement, with a price to pay). 5. Last but not least: Mercury is ‘calling’ (not making major aspects in sign or orb 5 degrees). 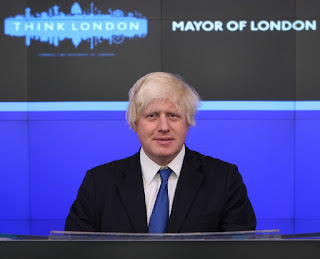 He will communicate somehow, anyhow, and at any possible level… Boris Johnson was severely deaf as a child and quiet. Mercury is exactly trine Pholus, indication of a turning point in communications. He definitely had one! Boris Johnson was first a journalist (Mercury! Later he went into politics. For politics in the chart we see Mercury/Saturn semi square Pluto (the combination of strategic communications that Is almost always there in the chart of a politician). Pluto is sextile his Midheaven. But somehow, anyhow, Boris Johnson remains a man of direct and fast communications. Of course there is more to tell about the chart and life. I’d like to mention that puppeteer Bill Barretta (Muppets) was born on the same day and also in the United States. His way to communicate is also specialJ.